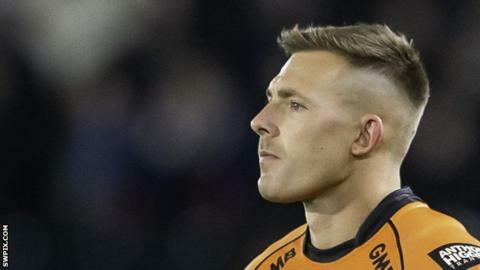 Greg Eden scored twice as Castleford beat Hull KR to start the Super League season with four straight wins and replace St Helens at the top. Rovers - without captain Joel Tomkins, who is awaiting a hearing to answer a serious RFL charge - took an early lead, but it lasted only moments. It seemed to spark their opponents into life as the hosts responded with three first-half tries to seize control. Another shortly after the break meant it was as good as over as a contest. Afterwards, Hull KR coach Tim Sheens said that a Rovers supporter had thrown a bottle at prop Robbie Mulhern after the match. "Some idiot threw a bottle and hit him. It was someone from our own supporters," Sheens told BBC Radio Humberside. "I know nothing other than I believe our own people took care of it over there, and the other supporters took care of it - I don't know any more than that." The game had ended in bizarre fashion, with Tigers down to 12 players and Rovers down to 10 thanks to four players being sent to the sin-bin in two separate incidents. Away from the night's controversy, Castleford could hardly have wished to start the season in more impressive fashion as they produced another strong display. St Helens have also won all four matches but their points difference is already 31 fewer than Daryl Powell's side and, in Eden, Cas have a winger in superb form as he took his tally to five tries in four matches. The Tigers' perfect record had seemed briefly under threat when Mose Masoe crashed through several tacklers to put Hull KR ahead. However, Jordan Rankin was alert moments later to gather a ricochet and touch down, before Liam Watts barged his way over soon after. A signature Cas try just before half-time saw the ball eventually get wide for Eden to finish, while James Clare was the beneficiary of some equally impressive play just after the restart. Rovers kept battling, with Masoe scoring a replica of his opening effort before Tigers hit back with Eden getting on the end of a Jake Trueman chip-through to snuff out any hopes of a comeback. There was still time for Chris Clarkson to break the visitors' defensive line and grab his first Castleford try, against his former club. And somehow, after the spate of yellow cards saw Rovers go down to 10 men they still managed to grab a consolation through Chris Atkin. "I don't think our performance was anywhere near where it needs to be or has been in the first three games of the season. "It's probably a lesson for us in terms of personal preparation because players need to play better than that - of course I'm still delighted with the win. "[On the game finishing as 12 v 10] It's a tough sport anyway, but discipline-wise it got a little bit loose and boiled over at times which was disappointing to see." "It wasn't easy. We played virtually the whole second half with no interchange which made things difficult. "We need to look on the video before we winge about the sin bin decisions, I don't really want to talk about it. "In 30-odd years I've never finished with no one fit on the bench. In fact with the sin bins at one point I had more people on the bench than on the pitch." Castleford: Mata'utia, Clare, Minikin, Shenton, Eden, Trueman, Rankin, Watts, McShane, Millington, Sene-Lefao, Clarkson, Massey. Interchange: Moors, Cook, Egodo, O'Neill. Hull KR: Dagger, Shaw, Keinhorst, Vaivai, Hall, McGuire, Drinkwater, Jewitt, Lee, Masoe, Linnett, Addy, Hauraki. Interchange: Mulhern, Greenwood, Atkin, Lannon.